The number one killer of women in the US is heart disease. Since so many bloggers are women, this outfit is particularly close to my heart. Friday was National Wear Red Day in order to show support for women and to promote heart disease awareness. Fashion designers came on board with the effort in collaboration with the federal government in 2003, with a red dress campaign to display dresses at Fashion Week, expanding into a fashion show of red dresses every year since. Read more about it here. My office collected money to fight heart disease and encouraged everyone to wear red. 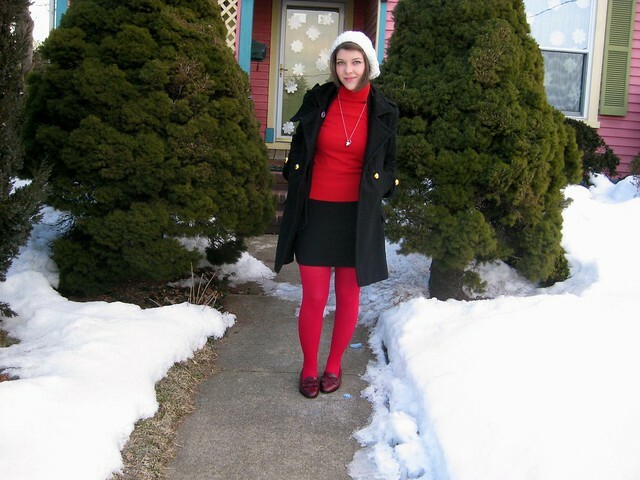 I accidentally wore my red dress the day before so I put together a red-heavy outfit for heart health awareness. Your hair is too adorable! I love that you did this, wish I had known it was Friday! It's good to spread awareness of this illness. Too many people don't realize how prevalent heart disease is among women and that it's largely preventable. Kudos! 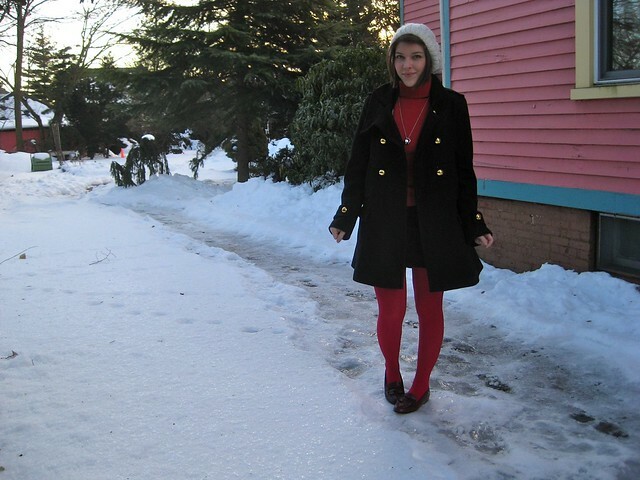 You are a spectacular person :) I love the inspiration behind this post and red look so great on you! I think it's great that you're raising awareness for National Wear Red Day. And I really love your hair! This is for a great cause and very stylish too, you rock! I didn't know that... you are adorable in red, and lovely combination with withe and dark blue, I love it! this is so absolutely adorable. and your hair! you got it cut, right? looks amazing! I totally dropped the ball on this and completely spaced on wearing red! I'm going to have to do better next year. I also didn't realize that you were thinking of doing a PhD - that's very cool. I'm hopefully about a year away from finishing mine...but we'll see! Love your hair, and your shoes are lovely. Thanks so much for your awesome comment over on my blog! I think the hair is the only residual side effect of Accutane I can think of. I was on it years ago, so there could have been some that have either gone away or I have just learned to live with, haha. In response to your comment: I use a Canon Digital Rebel T2i, and I love it! I'd totally recommend it! Also, I enjoyed reading your thoughts about acne and Accutane...I struggled with acne during part of my teenage years and it WAS hell. I got put on birth control pills when I was 13 for my acne, and it mostly cleared up after that, but I still struggled for a while, since most facial make-up products I used made me break out. :( I'm so glad those days are over, though, and I'm very sure you are, too! i just realized that you look like mila jovovich. i think i should buy anything red on my closet to show my support to those who died of heart disease.